MILTON KEYNES, UNITED KINGDOM (ANS) — Kristyn Getty, the celebrated hymn writer and worship leader, will feature this Easter as The Interpreter in the 2019 remake of the classic John Bunyan title, The Pilgrim’s Progress. 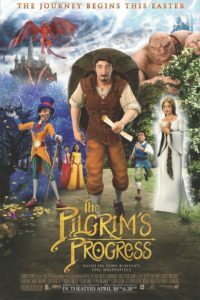 Produced by Revelation Media and Cat in the Mill Studios, The Pilgrim’s Progress will be released to U.S. cinemas Easter 2019 and also features Lord of the Rings star, John Rhys-Davies. The film will be shown on April 18 and April 20, distributed through Fathom Events. In recent years, according to a media release, faith-based films have proven to be one of the most effective tools for sharing the essential truths of Christianity worldwide. Classic stories that stand the test of time have the unique power to break down barriers of age, race, nationality, and language. The Pilgrim’s Progress has been translated into over 200 languages, has never been out of print and has sold over 200 million copies — more copies than any Christian book, next to the Bible. Written in 1678 by John Bunyan while in prison for holding religious services, The Pilgrim’s Progress is often cited as the greatest allegory ever written. “More than any other story (outside the Bible), THE PILGRIM’S PROGRESS has been used to inspire and challenge Christians to set their eyes on God, all around the world,” explained Executive Producer Steve Cleary. Revelation Media is unique in its commitment to creating projects that can first and foremost serve as an asset to missionaries around the globe. Several early scenes from the project were paid for specifically through the film’s Kickstarter campaign, where over 1,600 backers gave nearly $150,000 for the completion of the project. This crowdfunding, as well as the support of generous ministry partners including American Family Association, allows Revelation Media to fund the distribution of the film to those working on the mission field. Keith and Kristyn Getty occupy a unique space in the world of music today as preeminent modern hymn writers. In re-inventing the traditional hymn form, they are creating and cultivating a catalogue of songs teaching Christian doctrine and crossing the genres of traditional, classical, folk and contemporary composition which are sung the world over. In 2017, Keith Getty was made an “Officer of the Order of the British Empire” (OBE) by Queen Elizabeth II for his contribution to “music and modern hymn writing,” marking the first time the award had been given to an individual involved in the world of contemporary church music. Keith and Kristyn Getty are the authors of “Sing! How Worship Transforms Your Life, Family, and Church,” published in 2017 by B&H Publishing Group. The Pilgrim’s Progress will be in movie theaters around the U.S. on April 18 at 7:00 pm and April 20 at 12:55 pm. Tickets for The Pilgrim’s Progress are already for sale through Fathom Events or at http://pilgrims.movie .